Finishing a meal with a sweet treat like pudding is something which is unaccountable. It is very easy to whip up a simple pudding even after your craving for sweet strikes. I don't have a serious sweet tooth but my cravings for sweets often strikes at midnight which is the worst time for eating. So I go for fruit smoothies only. But last week my craving was a simple pudding and this was that pudding which I make at midnight though I have to wait until morning to taste. It has been quite long I make pudding at home. 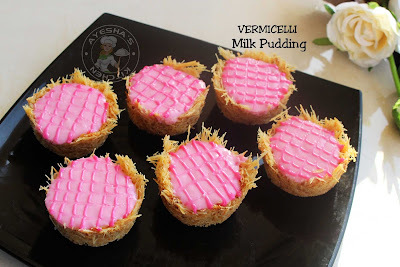 Many of my readers requested me to share some simple but impressive pudding recipes on my blog. 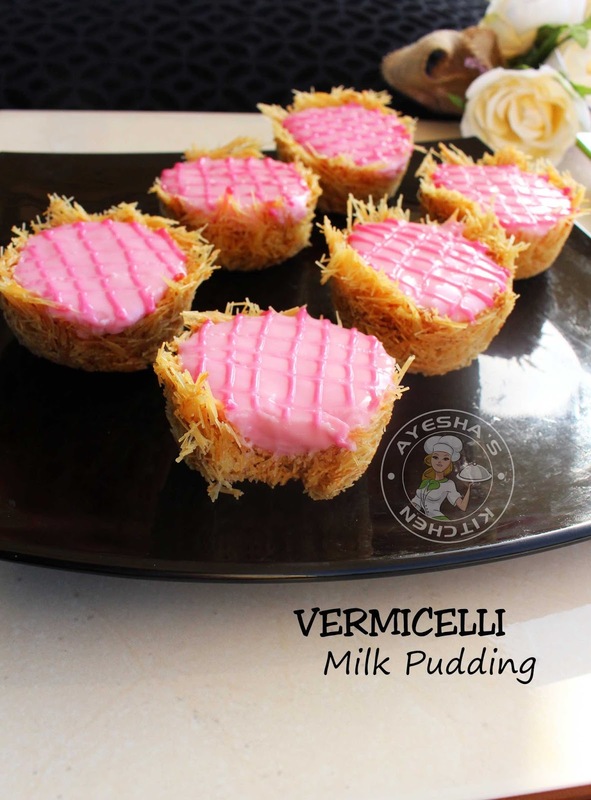 This milk pudding serves flavors of both roasted vermicelli and rose syrup. Moreover, it is too pretty to eat. Sometimes we really eat with our eyes, especially if it is a dessert. No china grass or no gelatin dessert is the other specialty of this easy pudding. Instead, I used cornflour. This is a Perfect milk pudding, I must say that. Here is the recipe showing how to make simple milk pudding/ quick dessert ideas/easy desserts to make/pudding recipe/pudding without gelatin/gelatin alternative for pudding/cornstarch pudding/vermicelli recipe/ sweet recipes/party dessert ideas. 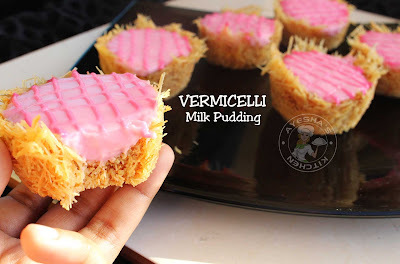 MAKING OF VERMICELLI CUPS - First, you have to set aside the silicon cupcake mold or mini cupcake tray. If you are using mini cupcake tray, then seal each cups with silver foil. Set aside ready. Heat ghee in a nonstick pan and roast the thin vermicelli on a medium flame till it turns slightly golden. Then add condensed milk and mix well continuously until well combined for a minute. Add half tsp of ghee, mix it and transfer it to a bowl. Now immediately fill each cupcake mold with this vermicelli mixture while still warm (it will harden quickly so do not let it cool). Press it lightly with your fingers or a spoon to get the shape of a cup.Keep it in the freezer for 30 minutes or for an hour to set. MAKING OF MILK PUDDING - After 30 minutes, make the milk pudding. Bring to boil milk in a pan over a medium-low flame. Once the milk boils, add condensed milk and mix very well constantly (as the vermicelli cups are sweet, I added less sweet for pudding. But sweet lovers can add 2 tbsp of sugar too for the pudding). Stir continuously for 2 minutes. Then add few drops rose milk essence to the milk and stir. Add cornflour mixed water (mix cornflour in a quarter cup of water) and stir continuously (do not take off your hand). You can see the mixture starts to thicken. Stir for 2 minutes over low flame until the mixture thickens enough to coat the back of a spoon and remove from flame. FOR THE PIPING - Reserve quarter cup of the pudding mixture to a bowl and add few drops of rose milk essence. Mix well with a spoon. Transfer it to a piping bag and keep refrigerated until the pudding is set. Take the vermicelli cups out of the freezer. Stir the pudding mixture and pour the pudding mixture into the vermicelli cups. Snip off the tip of the ping bag and make your designs. Now keep it in the refrigerator to set( not in the freezer). Chill for 6 hours and serve. Please subscribe my channel Ayesha's kitchen for more recipes.